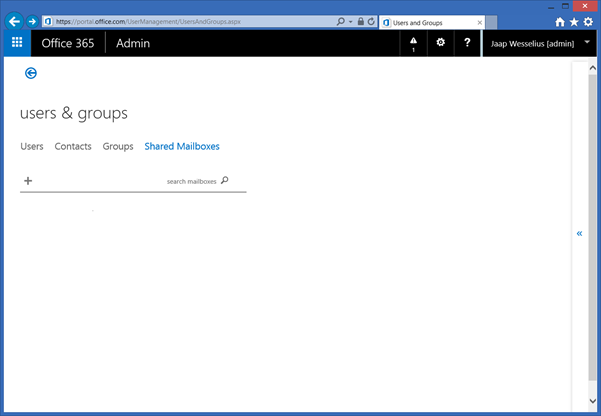 To create a Shared Mailbox (in Office 365 Small Business) login to the Microsoft Online Portal, click on Users & Groups and in the Users & Groups window select the Shared Mailboxes tab. 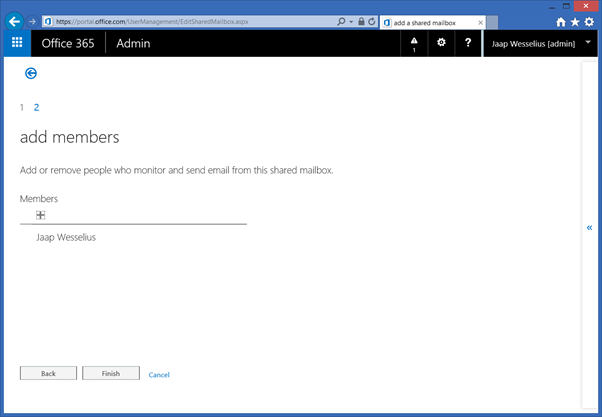 When using a Shared Mailbox there needs to be (at least) one user that needs Full Access to the Shared Mailbox, and you can add this user in the add members window. Use the + Icon to select a user in the people picker window. Click Finish and the Shared Mailbox will be created and the user will be granted Full Access. 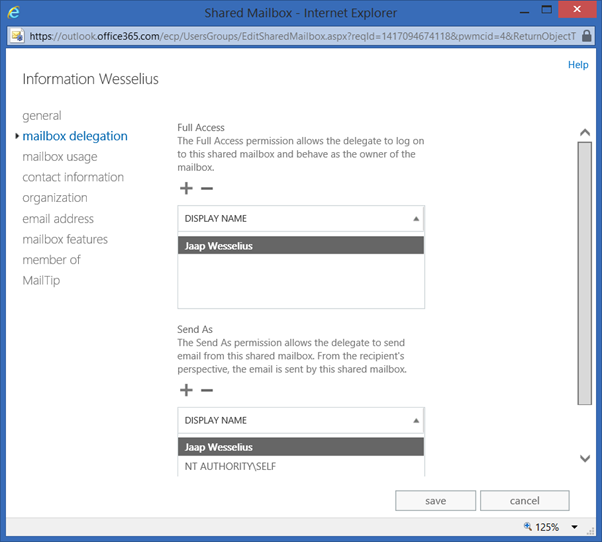 When you navigate to the Exchange Admin Center (https://outlook.office365.com/ecp) and select Shared in the Recipients section you’ll see the new Shared Mailbox. 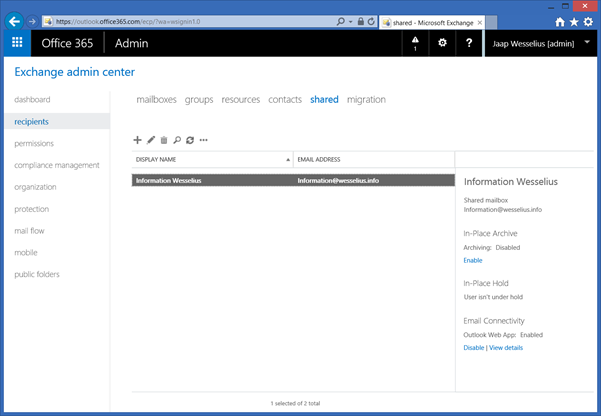 The –Shared option will create a Shared Mailbox, but you can also use the –Room option to create a Room Mailbox or the –Equipment option to create an Equipment Mailbox. All three however are Resource Mailboxes. Add-MailboxPermission –Identity sharedmbx@contoso.com –User joe@contoso.com –ExtendedRights "Send As"
When you have an existing Mailbox and want to convert this to a Shared Mailbox you have to use PowerShell since the Exchange Admin Console doesn’t have this feature. 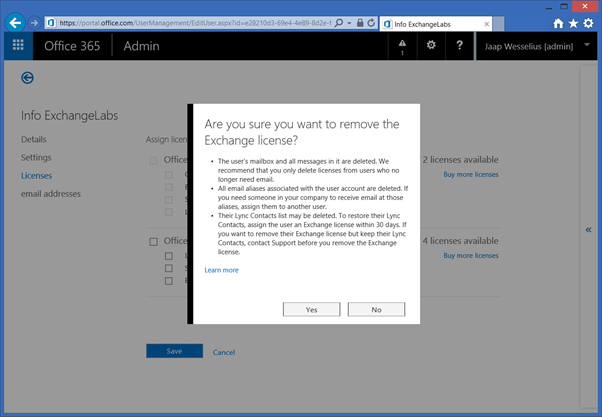 In the Microsoft Online Portal you can remove the existing license from the Mailbox (if there was one assigned to the Mailbox) since it is no longer used. Don’t let the warning message fool you. While this is all true for a regular Mailbox it does not apply to a Shared or Resource Mailbox so it’s safe to continue. This exact same scenario is what I discussed yesterday with a customer.